Norbert Siedler is satisfied: On Sunday, the Tyrolean crossed the finish line in the prestigious 24 Hours Nürburgring in sixth position. 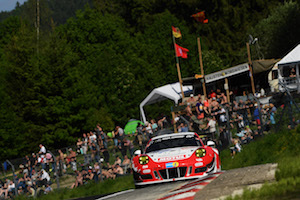 Despite a performance deficit, Siedler and his Frikadelli team-mates Klaus Bachler (A), Michael Christensen (DK) and Lucas Luhr (D) fought their way through the field from the 29th starting position and were classified as the best Porsche in the end. 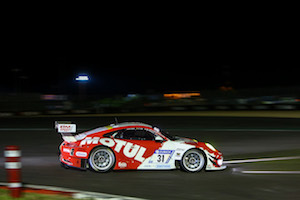 The biggest race weekend of the year did not start very promising for Norbert Siedler and his team-mates. “Early in the practice sessions we knew that we cannot cope with the speed of Mercedes, Audi and BMW because of the temperatures and the high tyre degradation. We only claimed the 29th starting position, which was quite a disappointment,” the Nordschleife-expert summarized. 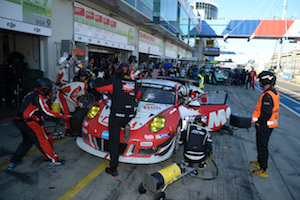 Norbert Siedler brought the Porsche 911 safely through the hectic starting stint and handed the car over to Michael Christensen after an hour, before Klaus Bachler and Lucas Luhr jumped in the car. In this order the four professional drivers changed the driving duty throughout the race. “There were no incidents at all, even after 23 hours we did not have to adapt our strategy,” the Wildschönau-based race driver was happy. With an impressive performance, the quartet had improved to the ninth position until the last pit-stop, four minutes behind position six. But half an hour before the end it suddenly started to rain and the starting field with dry tyres was facing a huge challenge. “This was our chance. The Porsche 911 is a strong weapon in the rain because of its rear engine,” Norbert Siedler described. The Frikadelli squad quickly decided to take the risk of an additional pit-stop. A move which was rewarded: Lucas Luhr was immediately able to attack on the rain tyres and brought the Frikadelli-Porsche home in an excellent sixth position. Norbert Siedler has no time to rest after the exhausting endurance race. Already at the next weekend he will sit in a race car again. At the third event of the Blancpain Sprint Cup in Zolder (Belgium), he will share a Grasser Racing Lamborghini Huracán GT3 with the young Argentinian Ezequiel Perez Companc.